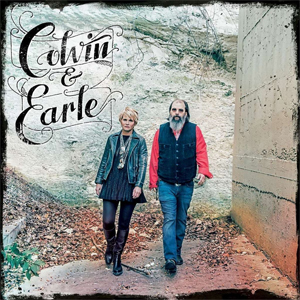 Though they both have thriving and creatively satisfying musical careers of their own, singer/songwriter/musicians Steve Earle and Shawn Colvin recently decided to work together on an album; Colvin & Earle will be released June 10. The longtime friends have also scheduled a tour in support of the album: kicking off June 4 in Pueblo, the tour will take the duo to 32 venues in about 15 weeks. Teaming up was Colvin’s idea. About four years ago, she did some duo gigs with Mary Chapin Carpenter. “I had a great time,” Colvin says. “After that was over and we returned to our solo careers, I started to think of who else would be a good pairing.” She had long been an admirer of Steve Earle’s songwriting, which she discovered on hearing his 1986 debut album Guitar Town. “ Steve can write very seemingly simple songs, but they’re often much more complicated than they appear to be,” Colvin says. She asked Earle if he would be interested in collaborating, and he quickly agreed. By necessity, the project would have to be brief, Colvin says, “because we all have our own work to do.” In fact the entire Colvin & Earle album was recorded in about ten days. “It was very impromptu, very ‘live,’” Colvin says. Spontaneity was highly valued during the sessions; that’s a quality that Colvin says she’s only developed over time. Colvin and Earle each selected two songs written by others, and brought those to the project. “I had been listening to the 60s channel on Sirius XM and heard the Nashville Teens‘ version of ‘Tobacco Road,’ and I just thought it would be a great song for us to do,” says Colvin. She also selected Emmylou Harris‘ “Raise the Dead.” “I thought that would be a good song for a man and woman to sing together, to each other,” she says. The Colvin & Earle tour will feature songs from the new album – “There was a conscious effort to make Colvin & Earle collaborative,” Colvin says – and will also feature songs that each of the composers have written separately. “But we’ll play and sing them together,” Colvin says.